Whew! You made it through the portal, winding your way through a maze of electronic energy, making it past millions of potential distractions, and arriving at my website. 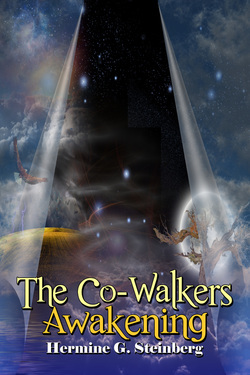 I’ve been waiting for you and I’m so glad you’re here so I can tell you about my book – The Co-Walkers, Awakening. Deep inside everyone there is a place where we go, from where our dreams take flight, where our creativity and curiosity live, and where our true voice resides. It’s the place where we are truly free to explore new ideas, visualize what life could be like, and think about what is really important to us. Its power is limitless, growing stronger each time we visit, nurturing and broadening its landscape, and paying close attention to what we learn from our time there. If we listen carefully, it whispers to us in our daily life, inspiring us to learn new things, take reasonable risks, and to appreciate our unique abilities. The stronger it becomes, the more it motivates us to make real the truths we find there. It ignites the spark that fuels our desire to go out into the world and bravely experience the adventure of life. It is our place of inner magic. It is our imagination. It is from where The Co-Walkers originated. I hope you will join me on this adventure. Explore the website, and find out more about the path of the Co-Walkers. I would love to know what you think about the book…or any other topic that is on your mind.